Pat Murphy - historian and well-known coast musician - has been working on his memoir, "Growing Up Downtown," for several years. During 2015, the Cleaver will feature one of his essays each month - along with historical photographs from his archives. 1940s North Beach Blvd. looking South - My grandfather, George Stevenson's business on the right downstairs in the Sea Coast Echo building. My hometown, Bay St Louis, Mississippi is approximately one hour’s drive east of New Orleans on the Mississippi Gulf Coast. The town and its neighbor, Waveland, have traditionally been small, sleepy weekend communities whose slow pace and close proximity to the gulf waters and its beaches were natural drawing cards to all. 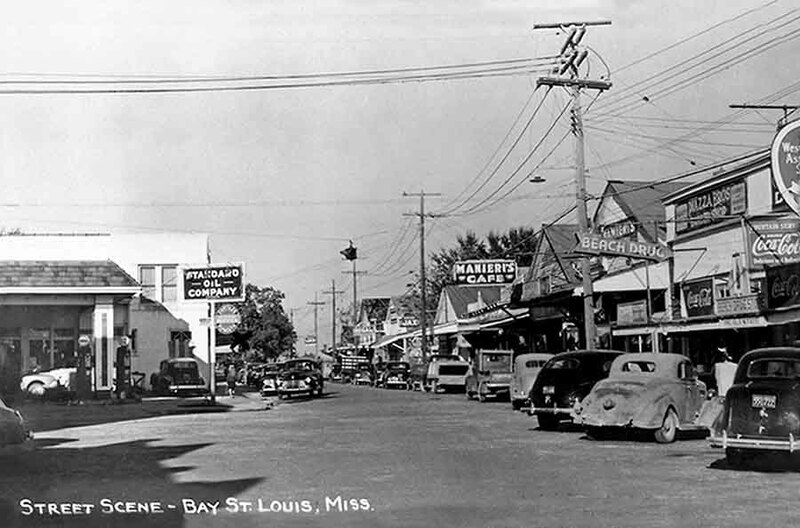 The Bay St. Louis of my youth (nineteen fifties) was the quintessential small town American experience. There were little league baseball, boy scouts, church groups and school functions all year around. The children - as well as the adults - enjoyed fishing, crabbing, boating, water skiing, sailing, playing on the beaches and swimming in the gulf. There were no strangers in the Bay St. Louis of my youth. Everyone in the town knew everyone else or at least knew of their family. It was, in my opinion, the perfect place and environment for a child to grow up in. On a scale from one to ten, it was a solid ten! Many of Bay/Waveland’s early residents were affluent New Orleans families who built weekend or summer homes here on the gulf coast as getaways from the hustle and bustle of the city. On weekends and at the beginning of each summer season entire families would pack up the house in New Orleans and bring everyone, including the domestic help, over “across the lake”. This lifestyle really became popular with the advent of the railroad line from New Orleans to the coast. Fathers would commute back and forth to their office in New Orleans by train every day or live in the city during the week and commute via rail on the weekends. With the coming of the automobile and the eventual construction of roads between the two areas, the lifestyle gained even more popularity. There were, of course, full time residents in the Bay/Waveland area but in the height of the tourist season the population might reach eight thousand and drop to twelve hundred during the winter. With the coming of the great depression of 1929 many workers lost their jobs in the city. The Bay/Waveland area offered hope of a new life away from the crowded city. Food was more plentiful, rent was cheap and opportunities abounded for small business start-ups. My mother’s family grew up in turn of the century New Orleans, LA. 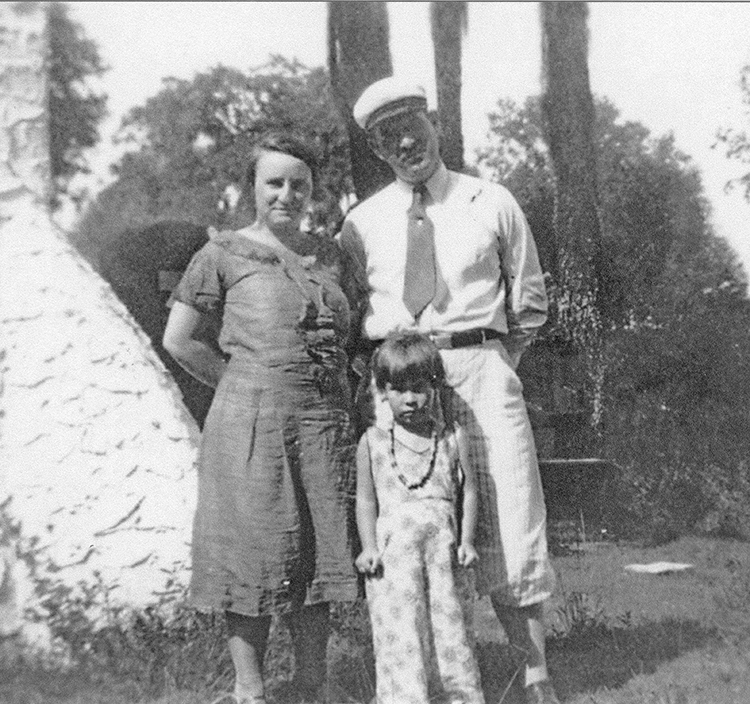 In 1924, my grandparents, George and Odile Stevenson, moved from New Orleans to Bay St. Louis. They moved into a house in the first block of Sycamore Street (named Good Children’s Street at the time). My grandmother, Odile Stevenson, was orphaned at a very young age and taken in and raised by an aunt, Ms. Camille Webster. Aunt Camille originally purchased this house on Good Children's Street and held the mortgage on it. My grandparents made payments eventually purchasing the house from my aunt. Aunt Camille lived with her sister Rita in a little shotgun house in the second block of Ballentine Street in Bay St. Louis. Aunt Rita died around the time that I was born but my Aunt Camille lived to be quite elderly in that same shotgun house on Ballentine Street. At the time she passed - in the mid-50's when I was eight or nine years old - she was still living in that old house with no indoor toilet using an outhouse in the back yard! 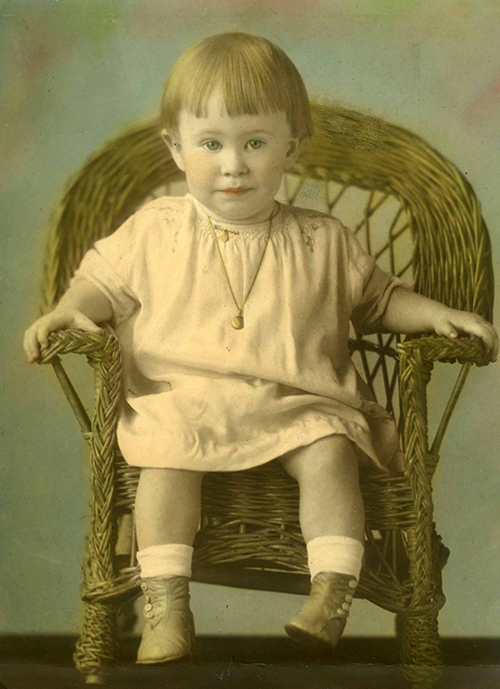 By the time of the great depression in 1929, my mother, Carol, had been born and my grandfather would commute to New Orleans by train every day to work as a clerk for a steamship company. Gramps was one of the many working people who lost their job when the great depression finally settled into the New Orleans area. My grandfather and grandmother had come to Bay St. Louis in search of a better life and there were opportunities to be had. Soon after losing his job in New Orleans, my grandfather found one of those opportunities and ran with it. Gramps and a partner, Townsend Wolfe, started a business hauling coal and firewood to the federal government WPA construction camps that existed in the area during the years after the depression. These camps were funded by the federal government to create jobs for the unemployed and built everything from schools to highway bridges (many of them are still around). From the coal and firewood deliveries Grandpa’s business expanded into the installation of electrical service in homes in and around the Bay/Waveland area and sales of electrical appliances. It was in this business that Gramps found his niche and began to prosper. 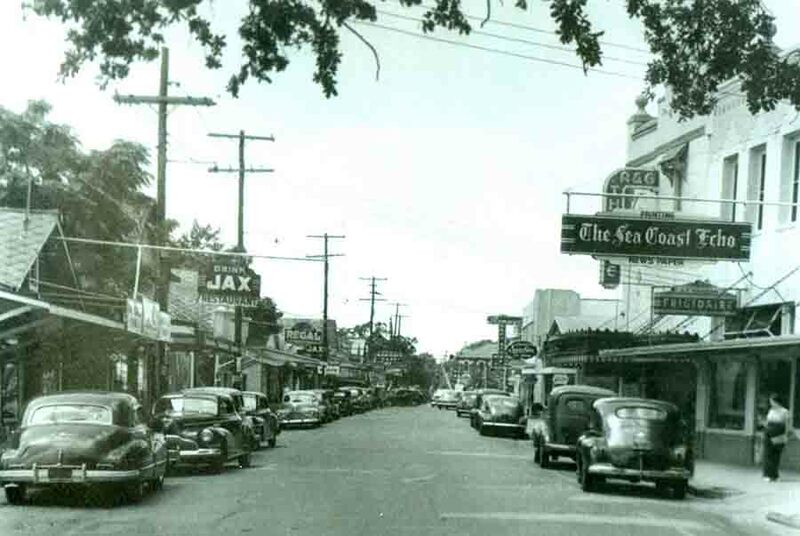 By the year of my birth in 1949, the Bay/Waveland’s area’s population had grown to around five thousand full-time residents and my grandfather’s business was thriving and growing in the vibrant downtown area of Bay St. Louis. By 1949, Gramp's business was located at 200 North Beach and The Sea Coast Echo was located upstairs (in the same building that currently houses the restaurant 200 North Beach). This is where my story of “Growing Up Downtown” begins.